Special Offer. Buy 6 Bottles for £65.00 each. Save £15.00 !! A dense, brilliant, deep-coloured robe, a delicate pink with orange tints. The nose, characterised by our red Bouzy wines, reveals intense aromas of red and black fruits (especially griotte cherries), enhanced with a touch of spices (pepper, vanilla). These are followed by balsamic notes (liquorice, aniseed) that lend the wine a certain freshness. Both the wine and rosé versions are distinguished by an elegance and aromatic complexity that will continue to intensify over time. In the mouth the fruitiness recalls that of the superb nose and is particularly dense. The wine also has an astonishing long finish. The various different balances this champagne achieves between structure and suppleness, and freshness and winey quality, make it a satisfying and full-bodied champagne, ideal for serving with impressive dishes characterised by rich and powerful flavours. It could well be matched with a delicately spiced marinade of beef. 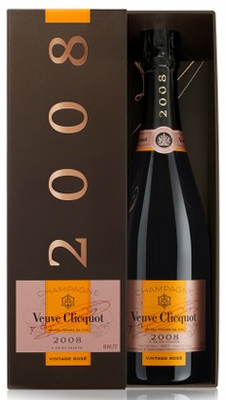 The structure and freshness of this champagne give it an ageing potential of at least 20 years. The Vintage Rose is composed of 60% Pinot Noir, 7% Pinot Meunier and 33% Chardonnay, to which has been added 15%of red wine from our Bouzy vineyard (Grand Cru de Pinot Noir). The choice of grape classification is of vital importance. The blend includes 17 crus only, which are either Grand or Premier Crus, These are located in the Montagne de Reims including Pinot Noir from Verzenay (Grand Cru) and Pinot Meunier from Ludes (Premier Cru), in the Grande Valléede la Marne with Pinot Noir from Aÿ (Grand Cru) and in the Côte des Blancs where Le Mesnil-sur-Oger constitutes one of the best Chardonnay (Grand Cru) vineyards. A dose of 9 g/l of sugar was added.